View More In Push & Pull Toys. O-Toys baby push toys encourages toddlers to get active and run around with their own little walker while developing coordination, balance, and motor skills. This colorful version of the classic push and pull toy will give hours of fun while providing a great form of exercise. Function: Develops coordination, balance, and motor skills. 1. Children use it under adult supervision. 2. If you have any quality problems,please contact us at once. Made of durable natural wood, non-toxic paint. Smooth wooden sticks are safe and easy for babies to catch and grab. Product Dimension：20" * 3.9" * 5.3"(L*W*H) Sticks Length: 20Inch. The strawberry walkers are with small rattles toys. 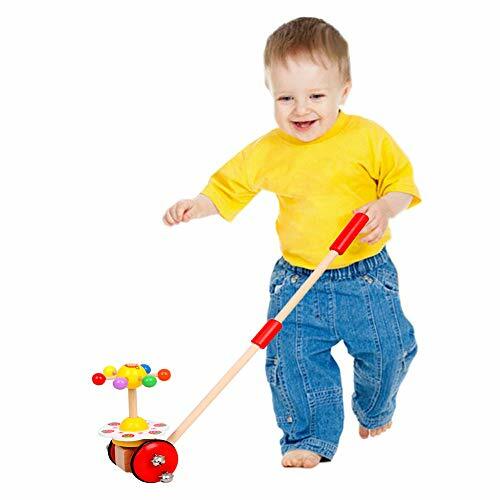 The bright colored baby walker develops kids' color recongition，shortly attract their attention. Great educational toy for kids to learn to walk, run and have fun. Great birthday Christmas gift for boys girls babies newborns infants from 18 months. Suitable for all occasions：indoor ourdoor rooms, play yards, bedroom, kindergarten.